I'm pretty sure that I'm the only teacher in Chicago who didn't take off for Good Friday! But that's okay because I have a TON OF STUFF TO DO. I don't have nay classes to teach, no kiddos to work with, a P.E. closet full of equipment that needs to be cleaned, and all of the Old School Rap that I care to jam out to all the livelong day. Come 3:00pm, it's my first Spring Break as a teacher! I'm wearing shorts. thus in keeping with the theme. Go and make bad decisions. 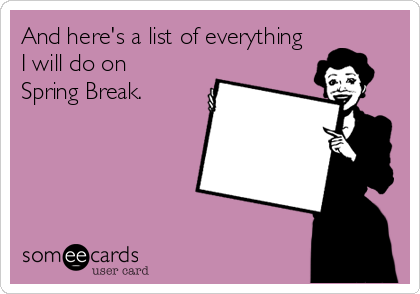 How is Spring Break coming along for you? How is your Spring Break coming along?